Our work is focussed on the elucidation of molecular interactions of bacterial pathogens with epithelial and endothelial cellular barriers using suitable model systems. Deeper insight into the molecular mechanisms will lead to novel approaches for diagnostics and therapy of infectious diseases and, moreover, might also open new ways to beneficially modulate overwhelming immune reactions of the host. Whooping cough is caused by the human pathogen Bordetella pertussis, a gram-negative rod. The disease is an acute respiratory infection restricted to man and has been named after its characteristic symptom, the ’whooping cough’. Mostly for children under 4 months of age the disease can be life threatening and the WHO still estimates about 500 000 deaths caused by pertussis. Pertussis toxin (PT) is a key virulence factor and has been associated with encephalopathies found as an occasional sequela of pertussis infections. 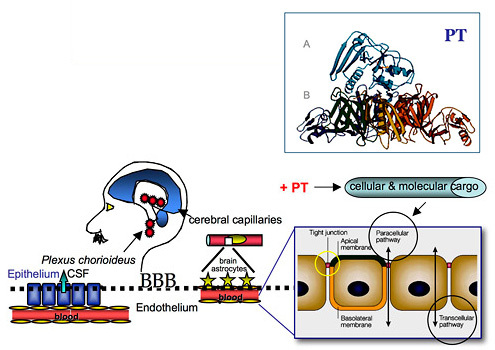 In this project we investigate the interactions of PT with epithelial and endothelial barriers such as the blood-brain barrier. Infections of the gastrointestinal tract are responsible for the suffering and even deaths of millions of infants, children, and adults each year. Health and nutritional status of an even larger population are undermined resulting in increased susceptibility to other illnesses. Bacteria-associated diarrhoeal diseases are a major factor for the especially high infant mortality in developing areas. The common inhabitant of the gastrointestinal tract, Escherichia coli, is a very versatile organism and exhibits remarkable genome plasticity. Its pathogenic representatives come in many flavors. 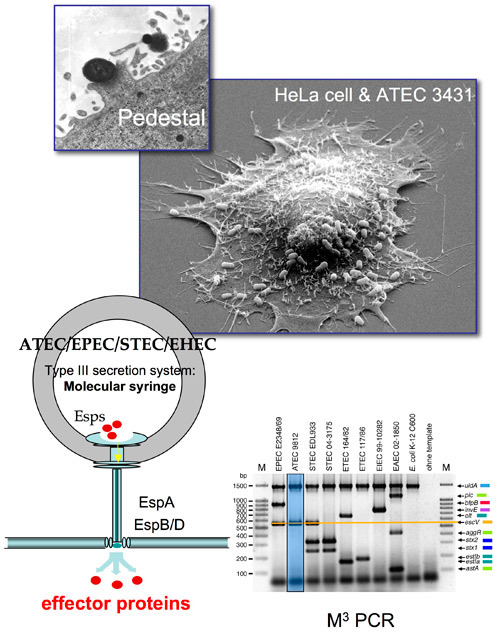 Some intestinal pathogenic pathogroups induce the ’attaching-and effacing (A/E)’ phenotype characterized by direct injection of effector proteins into target cells through a type III secretion system (’molecular syringe’) In this project we elucidate the molecular interactions of intestinal pathogenic E. coli with epithelial and endothelial barriers and immune cells. Some Gram-positive and Gram-negative bacteria that exert beneficial effects on the host’s health when they are ingested in large enough amounts are denoted ’probiotic’. Some probiotic strains suppress inflammatory reactions and are used in the therapy of inflammatory bowel diseases (IBD). 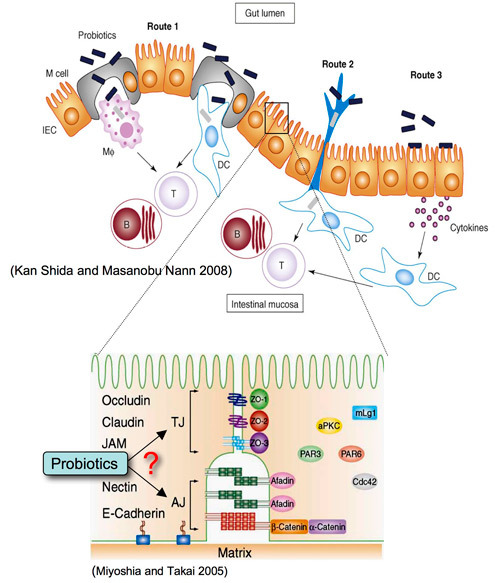 However, the molecular basis for these probiotics effects remains largely elusive. Here, we investigate the effect of several probiotic bacteria on junctional complexes and their influence on the integrity of the epithelial barrier. We could show that some bacterial effector proteins that are usually secreted and injected through a type III secretion system (T3SS) have properties of cell-penetrating peptides (CPP). These proteins are able to enter cells without the presence of bacteria or a T3SS and, furthermore, have the capacity to transport cargo into eukaryotic cells. We investigate the modulation of cellular signaling pathways, the possibilities for cargo transport according to the ’Trojan Horse’ concept, and pursue options for therapeutic applications. Bacterial autotransporters have developed into the largest bacterial protein family. 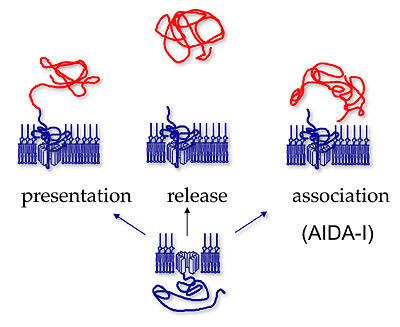 We pursue the molecular and cell biology of the AIDA-I autotransporter (’adhesin- involved-in-diffuse-adherence’) and investigate options for the surface presentation and secretion of heterologous antigens. 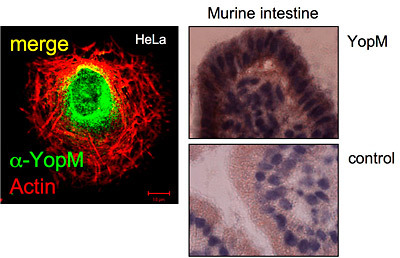 M cells of Peyer’s patches are responsible for the immune surveillance of particulate antigens. Despite their importance in the gut immune homeostasis still very little is known about M cell biology. 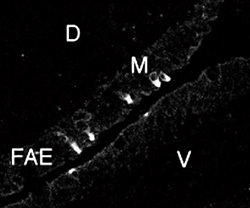 We investigate apical surface receptor as potential targeting structures to enhance M cell-mediated translocation.